Starbrite's Aluminum Boat Cleaner is an acid formula which is formulated to remove the waterline from your boat as well as scum and algae stains from your aluminum boat and pontoons. 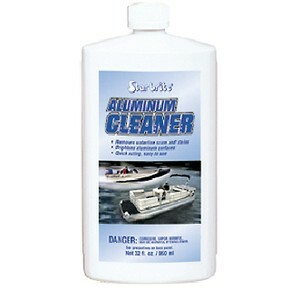 This aluminum boat cleaner also will help brighten dull aluminum without the need for hard rubbing and scrubbing. On top of that, its a biodegradable formula. Starbrite's Aluminum Boat Cleaner is formulated to be mildly acidic, which means it makes simple work of removing the scum and organic material found below the water line on aluminum pontoon and fishing boats. Word smarter not harder with Starbrite Aluminum Hull Cleaner so you have more time to enjoy your boat. For best results, follow Starbrite Aluminum Hull Cleaner with Starbrite Aluminum Boat Polish to restore your boats finish to like new condition.